I got the unit home after Christmas, and immediately installed it in the closet my 5th Gen Airport Extreme used to live in (and used to overheat in). Install was simple with the back plate (screw into ceiling, twist on access point until it locks). Then, making sure you’ve got the right port number on your PoE switch, enable PoE, and the access point boots up. Setup is a bit more complicated. You can use their Java app on pretty much any computer to do the configuration, but you don’t get the nice long term stats, or ability to do guest network portals if you don’t have it always running. So, I had a Raspberry Pi 2 I was already using for Cacti logging that I installed the UniFi software on (using the awesome instructions here). That got me up and running. I decided to just do a single SSID (rather than the dual SSID’s I used with the Airport Extreme (one for 2.4Ghz and one for 5Ghz)) because I knew the UniFi access point would soon support band steering (the ability to push clients that are capable of 5Ghz onto the 5Ghz network when possible even if they first join on the 2.4Ghz network). Setup outside of that was dead simple since the device is meant to be only an Access point, so there’s no need to disable routing, NAT, etc. Oddly, the unit does have a DHCP server, but it wasn’t enabled by default. 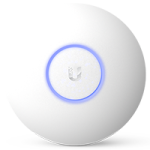 The UniFi software is interesting, but only really interesting if you use the products meant for it. So while my Access point lights up the wireless area perfectly, the WAN and LAN sections are dark because it doesn’t directly interface with the Edgerouter. You have to use one of the USG’s (UniFi Security Gateway), which is basically an Edgerouter Lite in a different case. I do hope at some point they enable UniFi to at least grab stats from the Edgerouter’s. Anyway, the new access point fired right up, and has worked flawlessly since. Things I used to have trouble with (like my MyQ garage door opener), and Apple TV have worked flawlessly since. The range on the new access point is awesome (finally killed the dead spot I had in one part of the house), and the speed difference between the 3×3 MIMO on 5Ghz for the Airport Extreme, and the 2×2 on the UniFi has been unnoticeable. In fact, I think the throughput consistency on the UniFi has been better all around, so I haven’t noticed anything but better all around wireless performance. Honestly, I’m never going back to consumer grade wireless again (which is echoed in an Ars Technica review about the UniFi hardware as well). I hope they start making these units faster so people can actually get them. =) It also makes me really want to build a house, or do a commercial install to see how well things like “Zero Handoff” (being able to roam from access point to access point with no interruption) and such work. If you ask me, Ubiquiti is quickly going to become Cisco’s biggest fear in the commercial wifi space. One of these access points is $110 retail. The “Pro” version is only $170. An equivalent Cisco access point is at least 3x that. Sure, their control software is better, but that will change… and even if it doesn’t, for the small businesses, K-12, and high end home market, I don’t see there being any choice. These are the go-to option.